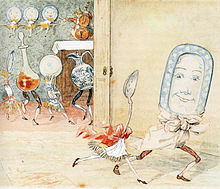 Spoon, a term for an eating utensil that is considered an inherently funny word, has been featured in many quotations. Better take her to the White Queen, she'll be safe there. Spoon. She came in through the bathroom window, protected by a silver spoon. Do you know that's the third spoon I've heard drop this month? When you coming home Dad? Harry Chapin, in "Cats in the Cradle"
You there! What the hell is this? We found this spoon sir. Mike Wazowski: I think I have a plan here: using mainly spoons, we dig a tunnel under the city and release it into the wild. James P. Sullivan: … Spoons. Sheriff of Nottingham: Because it's dull, you twit! It'll hurt more. Just when I thought things couldn't get any better... he spooned me. Australian: "You call that a knife? This is a knife!" Bart Simpson: "That's not a knife; that's a spoon." Australian: Alright, alright, you win. I see you've played knifey-spoony before. The Simpsons This should have an episode citation added. "Spoon Boy" in, The Matrix by the Wachowski brothers, indicating that all perceptions of external objects as entirely separate entities are constructs of the mind; this was also quoted in response to the rather grisly death of Private Witherspoon in the horror film Dog Soldiers (2002). They'll eat their words with a fork and spoon, and watch 'em! They'll hit the road and all be surfin' soon. This page was last edited on 9 January 2019, at 02:13.